Get yourself the best quote on a minicab, anywhere, in a couple of taps. 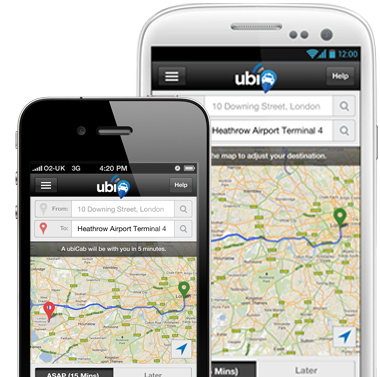 Download the free minicab app on iPhone or Android. Easily find your location and your destination using the map selection feature. Simply drag the map to select your location, after you’ve selected both your pick up and drop off locations we’ll then show your distance and a cheap quote. That’s the power of an Android or iPhone minicab app. No more searching for cash points. We accept cash, card and account for payments. Our security is top notch too, we use 128 Bit 3D security for all our transactions. All payments with the ubiCabs app are secure. If you’re a business customer you’re going to love this feature. We allow you to top-up credit into your ubiCabs account so you’ll never be hunting around for your card again. You now can choose what type and kind of vehicle you would like to be picked up in. Whether you’re on your own or with a group of friends, the ubiCabs app has a vehicle selection that’s just right for your trip.